the Glam! Zombie Apocalypse Surviver collab (closed) - GLAM! Specifically for Ody, doll yourself prepared for the zombie apocalypse and together we will SURVIVE. Basically, you should be in zombie-fighting clothes with your weapons. Also I was thinking maybe we could each sign up to 'bring' something (water, food, extra ammunition, flashlights and batteries, etc; basically any survival stuff) and then you can doll that prop as well and we'll put them all together in the center as our supplies store. Obviously more than one person can sign up to bring a supply, but we don't want everyone bringing the same thing. Depending on how many participants, I would say maybe three people per supply? Looks like we'll be using the Duckie exclusive! Don't worry about claiming poses; just use whichever you want. Deadline will be tentatively be August 8th, two months from today. If that's not enough time, let me know, and we'll extend it. And I'm keeping it open until then; if you want to join a day before and then get your doll in on the day of the deadline, that's 100% okay by me. We can never have too many people. Last edited by bookhobbit on Fri Aug 17, 2012 3:30 pm, edited 46 times in total. I like Duckie's base as our pick. I want to be the farm owner! Farmer person thing where we are preparing. XD I want to hold a sign that says "Infection Free Zone". Thoughts? That is a fantastic idea! I shall put you down as Team Leader and Homestead Provider, and you and your sign will be the centerpiece of the collab. SO IT MUST BE. YES! I have to do this collab! I will bring medical supplies! I know it's not on the list but I thought I'd throw ammunition out there just in case ... if not, put me down for blankets? Also, completely cool with the Duckie base. Last edited by Momma2Boog on Fri Jun 08, 2012 9:14 pm, edited 2 times in total. If you do, I wanna be that girl! Only if you promise to bring along extras to share for the pile! Glad to have you on board, Chicken! @Shannon: Great idea! Got you down. We'll definitely need the cuddles when the zombies are howling outside. I would so enter this but I can't draw weapons ._. Since we're going with the Duckie base if we decide to claim poses I want the 3rd set (below chairs), 2nd row, 3rd pose from the left (cigarette and bag) XD. @mybeautifulparanoia, I'd be glad you draw you a weapon if that's all that's stopping you! @Momma2Boog, thanks for bringing it up since I didn't even think about it, but I don't think we'll claim? I mean there are plenty of poses and it doesn't matter if there are a few repeats. They also have them for each individual state and Canada too . Anyway, I might post a WIP soon. This is what I have so far. 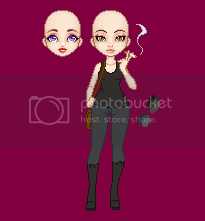 Ignore her baldness and the extra head. Lookin' awesome, Mooma2Boog! I love how the face edit is lookin'. mybeautifulparanoia- the premise is that we have a stronghold and are defending it. So you can go with someone getting ready to fight, or someone who already has, because you could just as well have come off guard duty. I don't know how an infected individual would go with Ody's 'infection-free zone' sign, though! Regardless, I'll be glad you draw you a weapon.